Former President Bill Clinton visited the Solar Sister program site in Karatu town, Tanzania, on Thursday, April 30. 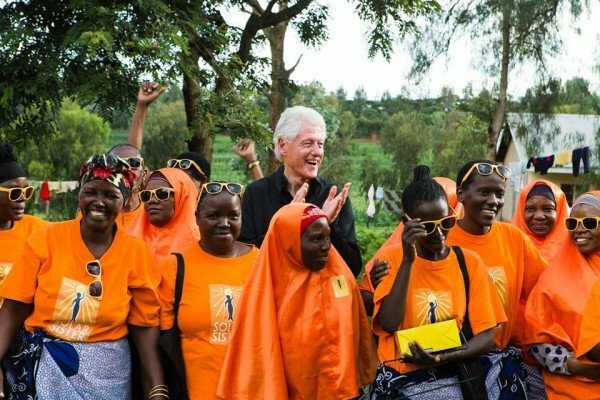 Solar Sister is part of Sustainable Energy Solutions Powered by Women’s Enterprise, a Clinton Global Initiative Commitment to Action. Solar Sister connects women in Tanzania, Kenya, Uganda, and Nigeria to training opportunities, and micro-financing groups to increase savings and investment. To date the Solar Sisters have trained 500 entrepreneurs, 300 of which were in Tanzania and as a result have 250,000 beneficiaries globally and for the commitment. President Bill Clinton also visited the Nainokanoka Dispensary in Ngorongoro, where he was greeted by health care workers and local villagers. The Clinton Health Access Initiative’s work has made pneumonia and rotavirus vaccines more affordable and ensured optimal vaccine delivery to children in Ngorongoro.